It’s a crystal you can see! This is a photograph of a plasma crystal (sometimes called a Coulomb crystal). The width of the photo corresponds to about 4cm. The dots are micrometer size particles suspended in an argon gas discharge. The inset at top right shows a view of the crystal looking from above. The gas discharge produces the diffuse purple glow, but the particles don’t emit light themselves. They’re being illuminated by a laser, which is why there’s a yellow line along the disc at the bottom of the image. That disc, and the other one at the top, are the two electrodes for the high voltage that drives the discharge. Gas discharges are commonly used in industry, for example in silicon chip manufacture and materials processing. Closer to home, sodium lamps and fluorescent tubes are also gas discharges. Gas discharges are a type of plasma- the “fourth state of matter”, which consists of free electrons and ions rather than the neutral atoms of a gas. 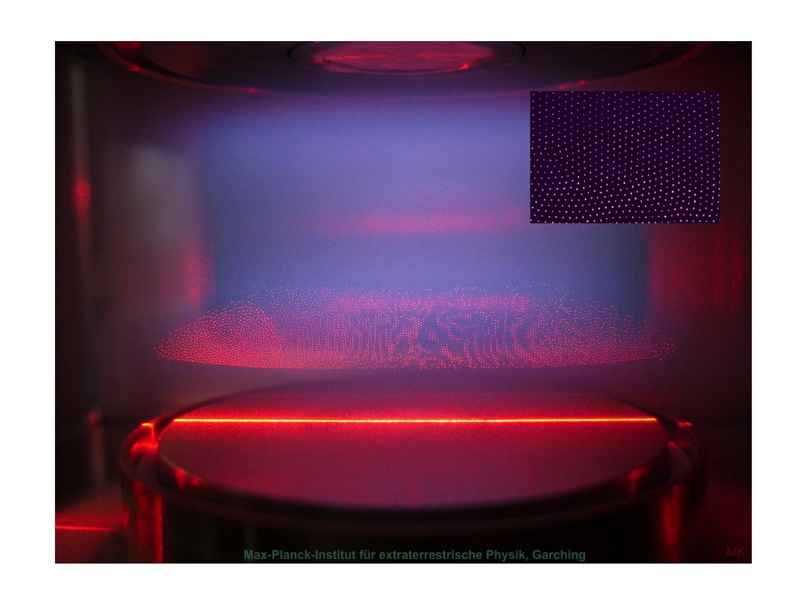 It’s probably no surprise to discover that a plasma with larger particles floating around in it (usually between a nanometer and a micrometer in size) is referred to as a “dusty plasma”. In industrial use, the dust is often an inconvenience (that’s why silicon chips are made in clean rooms), but researcher H. Izeki realized in 1986 that it might be possible to engineer the dust to form crystals. The dust picks up a charge as a result of being bombarded by electrons, and the individual particles form a lattice to minimize the electrostatic repulsion. Dusty plasmas were “crystallised” by a number of groups (for example in Japan and Germany) in 1994 and dusty plasma research has exploded since then. This lovely image is a photograph of a laboratory plasma at the Max Planck Institute for Extraterrestrial Physics in Garching, Germany. Hello, welcome to Crystallography365 – a project where we will be blogging a crystal structure a day in 2014. While we get everything sorted out, do enjoy the Royal Institution’s video on how it all started.